U.S. stocks posted their worst week since the run-up to the British vote to leave the European Union as investors refrained from making big bets ahead of this week’s presidential election. Also weighing on sentiment, a U.K. court ruling last week threatens to delay Brexit. The MSCI All-Country World Index fell to a four-month low, while the Stoxx Europe 600 slumped 3.6% last week. Moreover, the CBOE VIX Volatility Index rose near a four-month high, as the IBD/TIPP Presidential Poll, the most accurate poll since 2004, showed prospects for Donald Trump and Hillary Clinton have tightened with the race for the White House now too close to call. For the week, the S&P 500 fell 1.89%, its fifth weekly loss, the Dow Industrials lost nearly 273 points (-1.50%), MSCI EAFE (developed international) sank 1.55%. 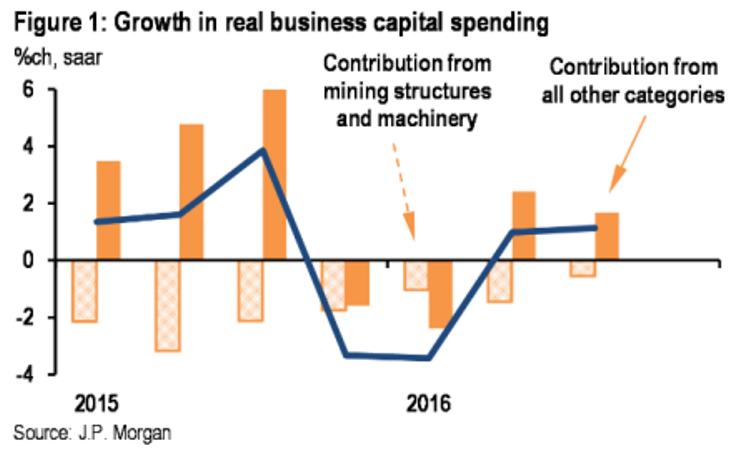 As this JPMorgan Figure 1 chart above shows, over the last eight quarters, real private nonresidential fixed investment—a broad measure of business capital expenditures—has averaged annualized growth of just 0.2%, down from 5.6% over the prior two years. And its contribution to annualized GDP growth has dropped from 0.7%-pt to 0.0%-pt. Most of this reflects sharp declines in oil industry activity and the strong dollar’s drag on U.S. manufacturers. But even as these factors have waned recently, growth in capital expenditures has remained sluggish. This chart also breaks out the contribution to growth made by the two categories most closely tied to oil activity. First is contribution from crude and natural gas mining structures and mining and oilfield machinery. Investment in these categories has fallen precipitously since late 2014 in reaction to low oil prices, while the contribution from “all other categories of expenditures” has been more volatile. Figure 1 shows that the drag on overall capital expenditures was largest early in 2015 before waning steadily through 3Q16. At the core of JPMorgan’s U.S. economic outlook for the last several years has been the view that the rate of potential GDP growth has slowed. The firm believes that demographics are driving a decline in labor force growth at the same time that we have encountered a slowdown in technological progress. With weak labor force growth and a shortage of new technologies driving investment, JPMorgan expects capital stock and capital expenditures to grow slowly by historical standards as the economy settles into its new, lower rate of trend growth. And there is little in the recent data on profits, business sentiment, or capital goods orders to suggest a near-term uptick relative to this trend. They thus look for only a modest acceleration in capital expenditures next year. If oil prices remain stable, there should be a swing back to positive growth in related capital expenditures. But oil activity has now fallen to such a low level that even robust growth rates would add little to GDP growth. Lastly, JPMorgan forecasts that non-energy capital expenditures should grow at modestly positive rates as the overall economy decelerates toward trend growth.